Never used your Code Rocket before? Start here! 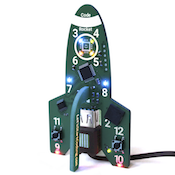 Turn on one of the lights of Code Rocket as you test each component before takeoff! 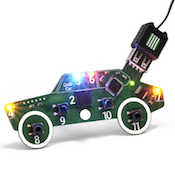 Light the booster rocket LEDs in unison to learn about combining code statements. Keep going with coding basics, turning on and off one of the rocket headlights. Blink the rocket's laser blasters in unison. Test the basic audio messaging center on Code Rocket with a beep! Combine blinks to send out a 'Save our Ship' message through space on the LED lights. Send out soundwaves with the 'Save our Ship' message in Morse code. Combine lights and sounds to reach any audience looking for your message. Make it easy to write and tweak Morse code messages and speeds. Now that you're a Morse code pro, use the buttons to beep out messages in real time. Learn to blast your lasers on command to break up space debris. If your signals get garbled by a black hole in space, you may end up with jumbled signals like these. Even astronauts need to relax sometimes. Create a light party in deep space. Lasers need a great sound effect. Code them in! When the big moment comes for takeoff, all systems must be tested and the countdown sequence begins! Latch your headlights on to look out for what's ahead. Warm up or cool down your boosters with tricks to fade the LED lights. Your circle of LEDs can be used for many things: signals, status updates, or just cool patterns. Take your blaster sound effects to the next level with your latest technological skills. 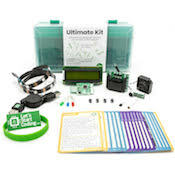 Combine your knowledge of variables, loops, and statements to control your LED Circle. No instructions here! Just a fun program with lots of features for you to explore and hack!